PhotoshopForums.com - How to subtract one shape from another? How to subtract one shape from another? Posted: Wed Jun 08, 2016 9:54 pm Post subject: How to subtract one shape from another? I know this sounds really simple, but I just cannot get it to work and I've googled and everything. I have two shapes (already created). Both are on separate layers. The layer that is on top I want to subtract from the one underneath. I am using CS6 by the way. I need the end result to still be a vector (not rasterized). Draw your first shape, then set the path to subtract in the top tool bar. 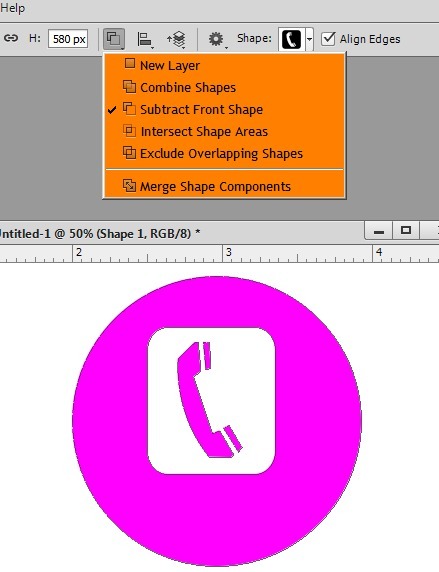 Now draw the second shape (on the same layer) a minus sign should appear on the tool.